One of the the largest market towns in Wiltshire, Devizes stands on the Kennet and Avon Canal and is home to the Wiltshire Museum and the Wadworth Brewery Visitor Centre. The history of the settlement dates back to the time of Norman conquest when a castle was established here. During it's early years a flourishing sheep market took place in the broad fields below the castle grounds, around which a thriving medieval town later developed. The town still has a large marketplace with an attractive 19th-c Gothic market cross and fountain. The market square is backed by many fine 18th-c brick and stucco houses and a magnificent colonnaded Corn Exchange. At the north end of the market stands the large brick built Victorian Wadsworth Brewery. 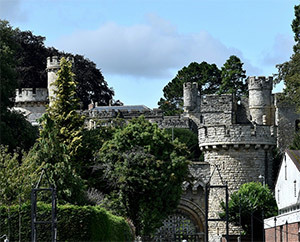 The town's current castle (privately owned) stands on the site of its predecessor, a Norman motte-and-bailey. The original fortification was built by the bishop of Salisbury, on the boundary of his land and that owned by the King. The castle's sighting therefore provided the town with it's Norman name, "Les devises", meaning the boundaries. The original structure was destroyed during the civil war and the present reconstruction is a folly of 19th-c origin. Within the town centre are many small family run shops and businesses. A traditional street market is held on Tuesday and Saturday. Leading off the marketplace is the famous Shambles Market Hall, a bustling covered market, trading since 1835. Near to the marketplace is one of the towns best known taverns, the Bear Hotel - an important coaching stop in the 16th, 17th & 18th centuries. It takes its name from the bear statue standing above its porch, which once stood on two columns in the marketplace. The inn was once home to Thomas Lawrence (the innkeeper's son), who was one of the country's greatest 18th-c portrait painters. Today devizes has more than 500 listed buildings, situated just within the quarter square mile of its town centre. Particular buildings of interest include Northgate House, a brick construction with a handsome porch that was previously the Kings Arms Coaching Inn. The famous writer George Eliot once worked there as a governess after it was converted into a house. The Black Swan is a fine 18th-c three-storey structure on the east side of the marketplace. Also Parnella House, built in 1740 by a doctor, who decorated it's front with an odd roughly carved statue of the god of medicine. Opposite the elegant Georgian Town Hall is St. Johns Alley, a narrow alleyway of lovely old timber framed buildings. Long Street has formal lines of exquisite Georgian brick and pastel coloured staccato houses. The 12th-c St. Johns Church has a handsome Norman Tower and Chancel. The Kennet and Avon Canal runs around the edge of the town. From Caen Hill, the canal descends some 230 feet via a flight of 29 locks; one of the longest sets of locks in Britain. Built in 1810, the canal slowly fell into disrepair following the introduction of the Great Western Railway. It has since been restored by the Kennet and Avon Canal Trust. Most of it has now been reopened, with peaceful towpath walks. A small canal museum provides the history of the canal and provides access to boat trips at weekends. Located in Long Street, the museum has exhibits and important finds from many local historic sites, including Stonehenge, Woodhenge and the West Kennet Long Barrow. There are also displays of Neolithic, Bronze, Iron Age and Roman artefacts found within the Wiltshire area. 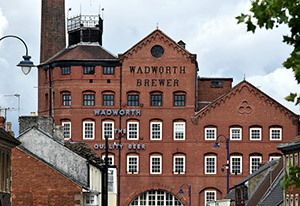 Discover the history of brewing and how Wadworth have combined traditional brewing techniques with modern brewery skills. Visitors can take a tour around the brewery and view a plethora of brewing memorabilia in the free Museum. The canal Museum displays artifacts covering the history of the canal from its construction to the present day and it's restoration. Regular boat trips are available on the Kennet and Avon Canal on Saturdays and Sundays.